Screenshots can be captured up to 3x every 10 minute interval for all users. The screenshots are uploaded and displayed under the Activity section of a user’s Dashboard as illustrated below. Select Activity from the main menu, and click on the Screenshots tab. Images are collated in blocks of 10 minute intervals. 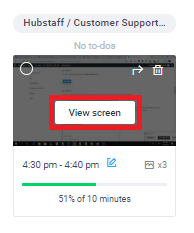 If your organization captures 3 screenshots per every 10 minutes, for example, all 3 images will be stored under the one 10 minute block in the thumbnail gallery. On the Screenshots page, hover over any single image, and click View screen to open the thumbnail gallery. If you wish to display the images in a continuous gallery, rather than per 10 minute segment, click the gallery icon at the bottom left hand side of the screen. A bar of thumbnail images will appear displayed across the bottom of the screen. Click on any of the thumbnails to reveal the full size version of that image.